At approximately 4 pm last Saturday I witnessed a surprising sight. Two totally naked young Thai men streaked across the road in front of me. Not something I can say I have ever seen anywhere, and certainly didn’t expect to see it here. They ran straight across my path just ahead of me, from bushes on one side of the road to another in Chiang Khian. There were homemade signs in English on the side of the road, odd single word keywords. When the guys streaked past it was a slow jog not a mad dash and there was no laughter ...nothing. They had straight serious faces and they didn’t look my way but I am sure they would have heard the bike engine. It was very weird, I suspect some sort of over the top and obviously illegal freshman hazing rite but I didn’t see any witnesses. Perhaps they were hiding in the bushes too. Below is some of the public feedback we received on social media in regards to last issue’s story on songthaew routes. Many foreigners find the system hard to understand, while others have reported that songthaews are now charging even higher prices or that it is hard to get one to take you where you want to go. Mike said “What consumers & tourists really want & need: AIR-CONDITIONED buses or mini-buses, not hot claustrophobic old trucks with rude cranky drivers.” One reader asked for a free map in English of the routes the songthaews use for tourists and locals and another reader suggested the routes should be color coded. One reader complained that people were being charged high prices to ride in the back of an uncomfortable and old pickup truck and that it was impossible to actually stop a proper taxi in the city. He added that this must give tourists to the city a bad impression. The same reader added that while the outward route passed the end of their soi the return took an entirely different route making it very inconvenient to use. A regular visitor to Chiang Mai noted that often they tried to charge 100 baht for a trip instead of the usual 20 baht and often the drivers didn’t even know where the person wanted to go. Another reader told the Chiang Mai Mail that often she cannot get a songthaew to take her anywhere or if they do they want 50 baht or 60 baht for a trip that was always 20 baht before. She added that these are not the songthaews that are on the routes but the regular roaming kind. Finally, a local man who often uses his car as a taxi told the Chiang Mai Mail that Chinese tourists will never pay more for the more expensive vehicles noting that they have told him they like the red songthaews because they are cheap. As always, the Chiang Mai Mail would love to hear your feedback on the local stories that affect your life, please email [email protected] with your feedback. Perhaps it is not so surprising that there are no animal cruelty laws in Thailand, but there should be. This country is not only developing to a point where these things should matter but it is a mostly Buddhist nation and as such should have laws protecting animals. I read with horror a recent opinion in the Bangkok Post about some poor gorilla that has been living alone on a rooftop in some kind of private zoo for the past 25 years. She may be healthy physically but that cannot be a good life for an animal that lives in a large social group. I was told that the only way it is illegal for someone to poison an animal is if it is owned and then they are damaging personal property. I have Thai friends who regularly post images of animal cruelty on Facebook in an attempt to raise awareness of the issue. I hope that as awareness spreads so does the revulsion at such disgusting behavior. People who lack humanity towards animals surely will lack humanity towards people. I hope that the Thai government will seriously consider implementing an animal cruelty law in Thailand and I strongly urge them to do so. I call on everyone to do the same. Maybe if they realize the strength of support they will get moving on this serious issue. “All beings tremble before violence. All fear death, all love life. See yourself in others. Then whom can you hurt? What harm can you do?” The Buddha – Dhammapada. As a local Thai person I am against the Mae Jo lantern release that happens every year before Yee Peng. Firstly, this is not a Northern Lanna tradition. Secondly, who will pick all of these lanterns up when they come down? People don’t think of all the rubbish and the possible danger of fires when they let so many lanterns go up. They will come down and there seems to be nothing in place for them to be cleaned up. They sell these lanterns for 500 baht each at this lantern release, who is keeping all this money? How much of that money will go towards cleaning up all the lanterns much less the rubbish that gets left behind by the people who come? It seems to me that these people only care how it looks on their Instagram or Facebook page and the rest of it is not their problem. Please see the attached photo, this is indicative of the entire length of Nimmanhaemin and parts of the sois as they end in Sirimangkalajarn Road after the heavy rains on Wednesday night, October 29. 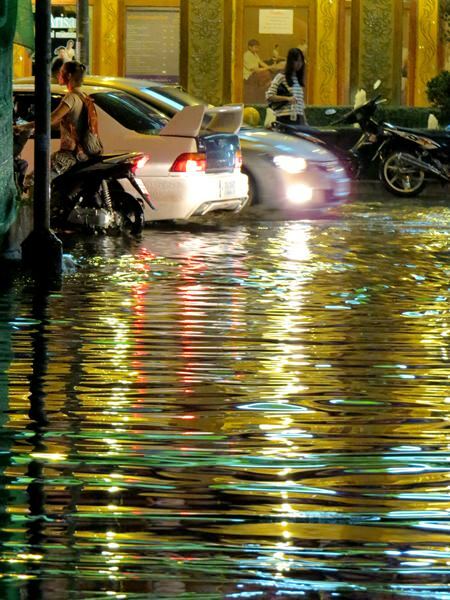 I was caught out in this rain and even after it stopped raining could not go anywhere at all, It was flooded from Soi 6 at the Tesco Express all the way to the Super Highway. I realize that it is at the base of the mountain but am still not really sure how the flooding can be so bad when the canal is between the road and Doi Suthep. Luckily the floods dissipate after a while but still, it makes it very difficult to drive Nimmanhaemin. Even more difficult for those on motorcycles who do not want to put their feet down in the very dirty water. It is a pity that the drivers in cars do not have some sympathy or consideration for those on the motorcycles in these cases. I do hope that some day the city can find a way to solve this problem.